The interwebs are currently a buzz with news about big California wine brands coming to Oregon's Willamette Valley. Some folks see it as a boon to the industry and others, like myself are skeptical and weary of the impacts these big labels might have on what still very much feels like a family industry. There are still stories of small family operations getting started up and down the Valley. One of them is Keeler Estate Vineyard in the Eola-Amity Hills. In the Eola Amity Hills AVA you will find some of the Wilamette Valley's most respected vineyard sites. Among them the renowned estate vineyards of Cristom, names like Majorie and Louise should be well known to Oregon Pinot buffs. Temperance Hill is here, Seven Springs Vineyard of Evening Land fame, as well as Zenith Vineyard, Le Puits Sec of Evesham Wood and the estate Bethel Heights vineyards among many, many others. So, if you were looking for company when deciding on where you might plant a Pinot Noir vineyard, you could certainly do worse. And so Craig and Gabriele Keeler came to plant wine grapes on thirty five acres of a two hundred acre parcel that they purchased in 1989. Keeler Estate Vineyard is set in a plot of land that the Keelers originally had chosen to graze and raise Hampshire sheep something they did with their children through 4H. As their children got older the desire to raise the sheep waned The parcel was vast and consisted of south facing slopes, great air drainage and sedimentary soils. They had a little analysis done and then got down to the business of planting a vineyard. The Keeler property has a lot of variance, both in terms of elevation, and soils. The hope is that this place has a set of signatures that the right soil and Pinot clones could find a sweet spot. "Our soils vary from Steiwer, Chehulpum, Hazeiair and Carlton – Chehalem types. The majority of the hill site is shallow loamy soils to soft sedimentary rock and varies in depth. When you bring up the sedimentary rock it is full of ocean fossils of all types and our thought was this is a very interesting site and should produce its own style of grapes" says Gabriele Keeler. The Keelers got serious about strategy and have tried to match their planting to the various soil types. "Based upon the soil map we have positioned 15 different vineyard blocks to date on the property. Each block is designed to fit the soil types and a variety of root stocks were selected based upon vigor of the site, available moisture along with the type of trellis used." They farm the vineyard using biodynamics and have had to be patient as the dry farming approach has led to markedly different plant growth and root development in the vineyard's different blocks. The vines have come along at different rates depending upon which block and or soil type they were planted in. It is still a very young vineyard. The fruit from the Keeler's vineyards is largely purchased by other wineries, Montinore Estate buys most of it. For Ben Thomas who makes the red wines at Montinore the Keeler Estate Vineyard fruit has demonstrated reliability and consistency even it it's youth. "The last few years we've been using the 115 that grows down in Keeler’s lower vineyard. The fruit has been exceptionally clean through the vintages, including a couple tough years that saw other vineyards struggle. What the fruit has added to our blend is a more traditional “Oregon Pinot” flavor, for lack of a better term, from the marine sedimentary soils. Their newer plantings on the hill are very interesting as well. I had the privilege of tasting grapes of every block at the peak of harvest and found there to be a lot of character on the hill, especially with the Pommard and Wadenswil clones." 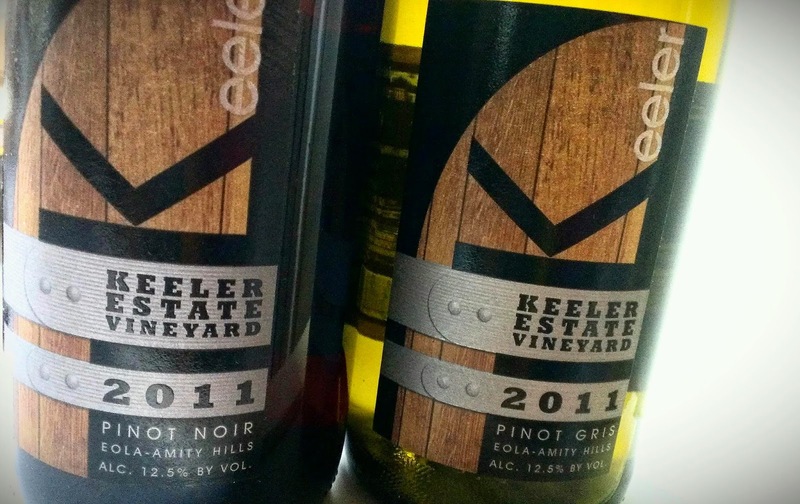 The Keelers have also released wines under their own label Keeler Estate Vineyard. Right now they're bottling a Chardonnay, Pinot Gris and Pinot Noir. Winemaker Darcy Pendergrass who was making the wines at Amity Vineyards for a long time. Knowing that we're dealing with very young vines I asked Darcy what they might express in terms of a site signature for the young vineyard. "Obviously I've worked with Amity Vineyards fruit for over a decade which is a very unique site it tends to be more of an earth driven wine not a lot of fruit aromas big tannin and usually great acid. I've also worked with Crannell Vineyards which is on the other side of the hill from Keeler which always has tons of fruit. What I'm starting to see from Keeler is a blend of both sites in terms of flavor. It's always hard working with young fruit in terms of tannin and weight as the vines age we will see were we end up." I was able to sample their wines and though young I think they show a youthfulness but also highlight a high acid site with pretty fruit flavors and minerality that may have the potential to make some compelling wines down the road. These wines were provided as samples by the winery. Site photos from Keeler Estate Vineyard.